Kettle Brand certainly keep it simple. And so shall we. Color coded bags. Colors associated with the flavor. Minimalist design. Plain but fairly ideal for marketing purposes. The split color bag works well with the green strap-line to make its point. The salty seasoning appeared to provide these Chips with an almost rigid and robust crunch. Not the dried oil saturated style that can often feel like biting through wood, as seen with some Kettle Cooked Chips, but a fresh, crisp crunch. 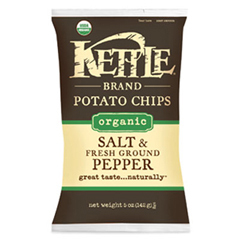 Fairly regular looking Kettle Chips with some good character. There were large oil bubbles. The surface was not as bumpy and oil bubbly as found with some Chips. There was visible potato skin on some Chip edges. There were the usual folded and wriggly Chips. There was also quite a lot of powder and pepper seasoning. Kettle Brand appear to be giving with one hand and taking away with the other. If you care where your junk food comes from and care for nature, you may prefer these, but if you are concerned about your health and well being, but still enjoy the world's favorite snack food, you could choose the low fat version of the same flavor. It tastes the same to us, so this is our review of the lower fat version: Although some would view this as a fairly plain and standard Chip variety, it is easy to get it wrong - there is often an overwhelming pepper taste. A good Chip balances a flavor combo by having similar hits of the taste while eating, or bouncing the taste from one to the other. This is certainly a case of the former.